← Leaving for Arizona tomorrow! My blog wouldn’t be a true and accurate account of my running if every post was an upbeat and happy regurgitation of a recent run or race. 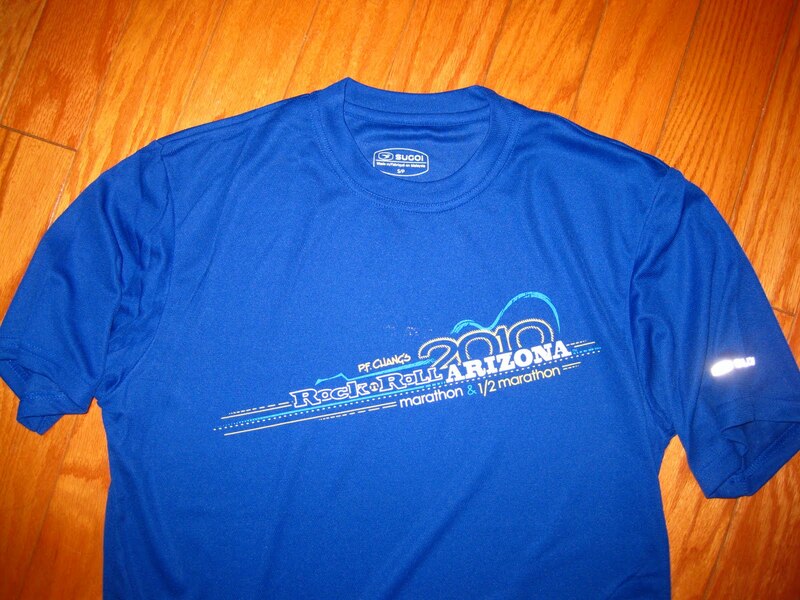 As much as I would enjoy explaining how much fun I had in Arizona at the Rock ‘n’ Roll Arizona Marathon and Half-Marathon, I can’t really do that. I pulled out of the race at mile 6. I was able to run for about 2.5 miles and the rest of the time was a walk/job. The last mile or so I walked the course desperately looking for a race official or medical tent. neat boutiques, restaurants, and bars lining the streets. That night we ate at Gordon Biersch Brewery. I’ve eaten at one before in San Diego and it was pretty nice. 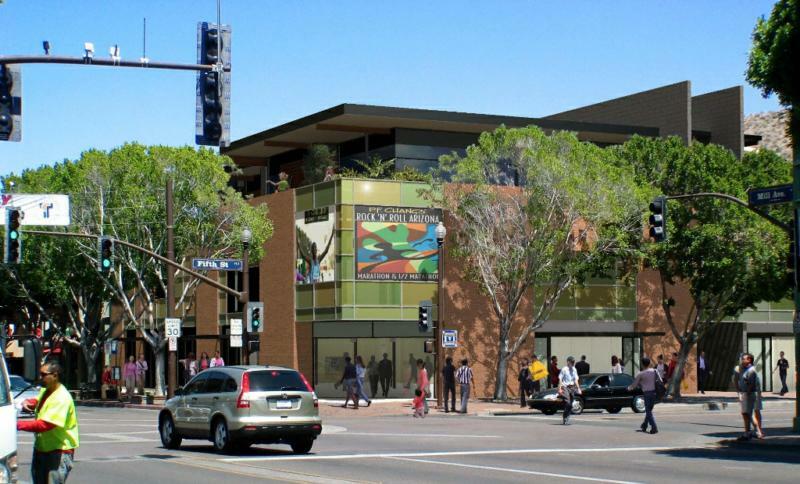 Saturday – In the morning we drove to downtown Phoenix to go to the convention center. Of course we went during a time when Deena Kastor and Ryan Hall weren’t there, but it was still neat. This is the first expo Zac has ever been to and he actually liked it. It was a nice, big expo with a spacious layout. As usual, once we left, people seemed to be flooding the expo. I always like going to them earlier on Saturday, or even on Friday, instead of Saturday afternoon. 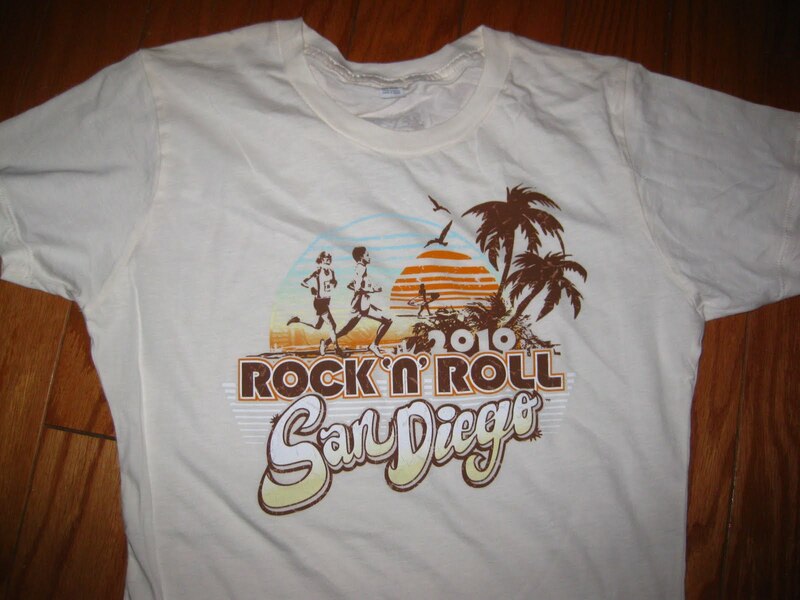 At the expo, I signed up for the RnR San Diego Half (which I am thinking might not have been the best idea now given my injury seems more worse than I thought) and I got a neat shirt for it. 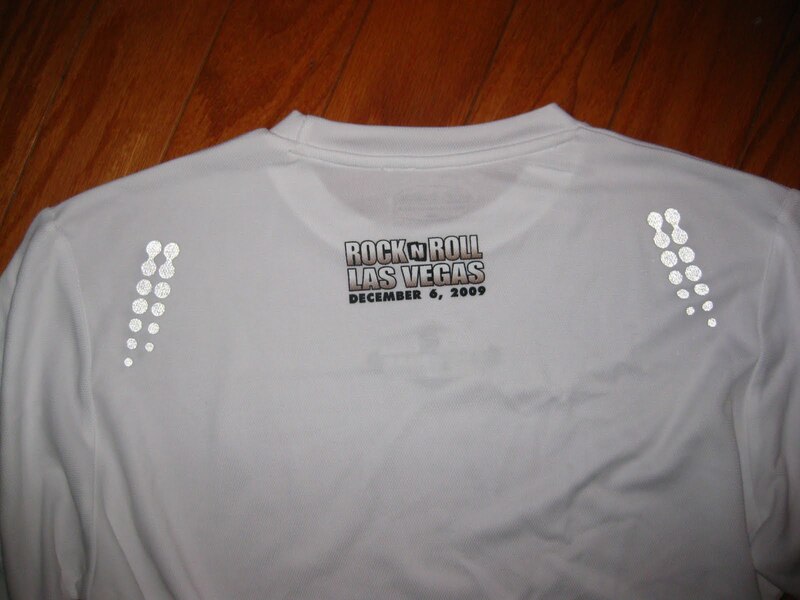 Also, I scored a tech shirt for the RnR Vegas Marathon for only $10! What a deal! The rest of the day we visited Zac’s younger brother who lives in AZ for right now. 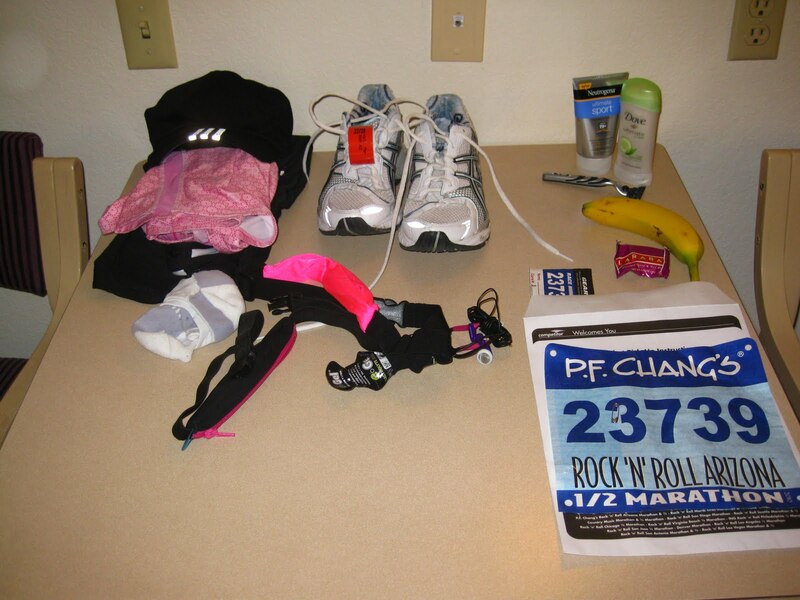 Before bed, I set out allof my race day stuff to make sure that I had everything that I needed. 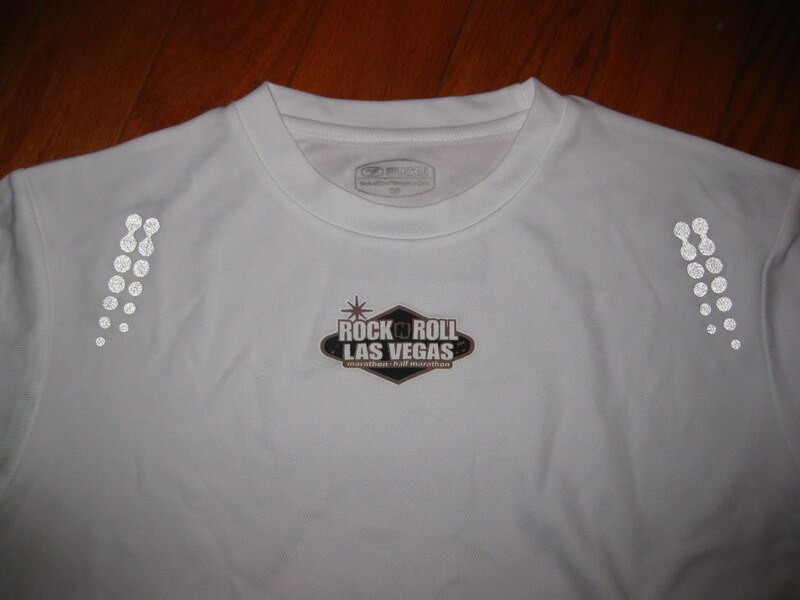 RnR San Diego shirt for registering. Fitted, super cute. Race Day – The race didn’t start until 8:30 a.m. That is such a late start compared with what I am used to. Then again, it was still pretty dark outside at 7:00 a.m. Going into this race I was fully prepared to have to walk/run it because of my recent injury, even though I stayed off of it for some time and it felt much better. Seeing as how the race was a point-to-point race, there were shuttles taking the runners from the finish to the start, and the race information said to expect a 40 minute shuttle ride to the start. Given this information, I planned to arrive at the shuttle location a little more than an hour before the race start. What I didn’t expect was the long line of people (approximately about .3 miles or so) waiting for the shuttles. While in line, I met a nice lady and unfortunately I don’t remember her name. She was super nice and we talked about school, past races, her recent home purchase, and my injury. By time the shuttle reached the destination, the race had already started. With all of the congestion in downtown Phoenix, the shuttle had taken almost an hour to get there. As I got off of the bus I hear the last part of the National Anthem and the race started. I’ve never been late to a start like this before and of course the shuttle dropped us off at the end of the starting line, by corral 24, and I was in corral 3! I jogged up closer to the start and jumped into corral 7. As I crossed the staring line, I started my Garmin (which for some unexplainable reason decided to work all of a sudden) and took off. As I started running, I was cautious and very aware of how my foot was feeling. After a mile I was ecstatic that my foot felt fine. Just running amid all of the other runners, pain free, was an amazing feeling. Then, I reached the second mile and my confidence grew. I realized how much I missed running these past couple weeks and how much I genuinely love running. I was also thinking that I would be able to make it the whole race without walking; I wasn’t concerned about my time, I just wanted to finish it. A couple minutes later, my foot began to hurt. It was a painful, burning and stinging sensation. I ran a few more strides, realized I needed to stop, made my way to the outside of the road and began walking. I fought back tears with all of my will and tried to keep on. Walking didn’t hurt and I was thinking I could probably do a walk/jog. As I was walking, I met up with another runner who was also walking. I approached him and asked if he was also injured and he told me that he was signed up for the full, but had back surgery 4 weeks ago so he switched to the 1/2 and was going to walk it. He was a very positive man. He was saying how it was better to be out there walking than not doing anything at all. While walking with him I learned that he was from North Dakota and that he and his wife had signed up for and trained for the full together (until he hurt his back). She was still running the full. We decided to start jogging again and I didn’t make it too far before my foot started to hurt. I encourage him to go on ahead of me and I wished him luck as I went back to a fast-paced walk. At this point in the race I was almost to mile 4 and the thought of pulling out of the race entered into my mind. Just thinking of pulling out of the race brought tears to my eyes. As a few drops slid down my cheeks I thought of that man and his positive attitude and kept walking. I tried jogging a couple more time but each time was more unsuccessful than the last one and I finally knew what I needed to do. I knew I needed to pull out of the race, something I had never done before and never thought I would ever have to do. I was a little more than 4.5 miles into the race. From that moment, I began desperately looking for a race official, police officer, or medical station. I was texting Zac telling him what was happening and trying hard to fight back the tears. I located a Team In Training coach along side the course and asked him where the next medical station was and he told me it wasn’t until mile 8. It was a horrible feeling knowing I needed to pull out of the race and not knowing exactly how to. I couldn’t locate any of the people who I knew could help me. As I continued to walk along the route, I finally approached mile 6. I saw the mile marker, the time, and a race volunteer. I told him I needed to pull out of the race and I stopped right there. The decision was final; I had pulled out of the race. DNF. He called into the SAG wagon. It was at least an hour and a half away and so I continued on to find some police officers who could help me locate an address to give to Zac to put into his GPS so that he could pick me up. As I was talking with the officers, the same girl that I met in line and sat with on the shuttle stopped by. She asked how I was doing and was sad that I had to pull out. She gave me a hug, wished me a speedy recover, and I wished her good luck on her race, and she went on. One of the officers volunteered to drive me to the hotel and I was so grateful. Even though I had already decided to pull out of the race, it was not official. I was in a police car en route to the hotel. I was bypassing the course, bypassing the finish line, and bypassing my chance to see Deena Kastor in the awards ceremony. The lady police officer took me to the closest point that she could. I had to walk about a half of a mile alongside the last stretch of the marathon to the hotel. Zac was walking to meet me. The minute I met up with him I began sobbing. I was just so upset with myself, frustrated with being injured, and disappointed that I had to drop out of the race. He assured me that it was “just a race” and one I could do over again. Still, I was pretty bummer. After I got back to the hotel, we got in the car, grabbed some lunch, and headed back home. I’ve never had to DNF before and it is horrible. I didn’t think my injury was this bad and was certain that 2 weeks was plenty of recovery time. If you are still reading this, thank you. This has probably been my longest blog entry to date, but I had a lot to say about my bad race experience. On a positive note, once I am healed I do expect to return to running long distances and racing and in the meantime I am riding the bike at the gym and focusing on weight lifting. 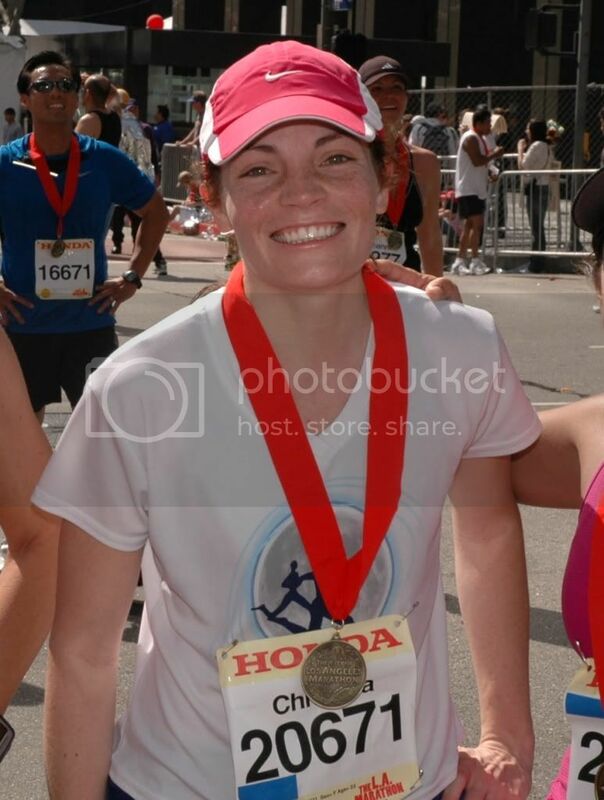 This entry was posted in Half Marathons, Injuries, Race Reports. Bookmark the permalink.